Exciting news!!!! Blanche Mikado has returned to Withymead Stud and will be available to a small number of outside mares. 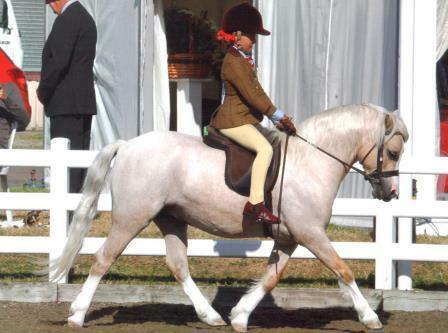 Mikki is the sire of the top ridden pony Waxwing Panama and the top inhand and future ridden pony Withymead Pimms. A big welcome to Withymead Honey Bear, chestnut roan colt foal out of Forlan Honey Cookie and by Rowfantina Ottoman. 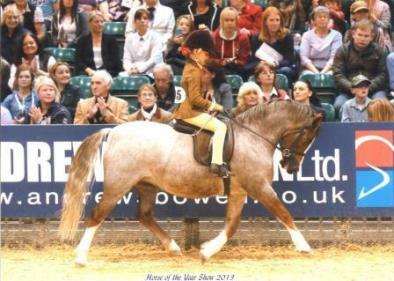 Ottoman is by Roseisle Pandytudyr and his foals are proving to be top childrens ponies, Rowfantina George Washington was placed 2nd at HOYS last year as a Lead Rein pony. Very pleased with this boy. boy. . 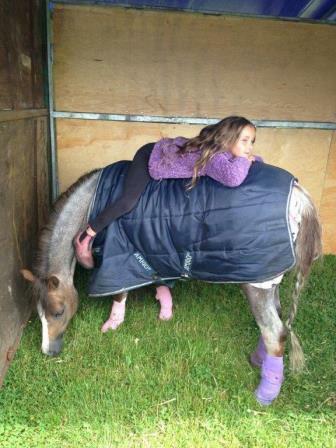 This year we took it easy with just one pony, the very special Islyn Balch. She didn't let us down and we were so close to getting 2 Royal International tickets with a 2nd and a 3rd in Pretty Polly First Ridden Qualifiers and then a fantastic 2nd and Reserve Champion in the RI Heritage First Ridden. What a good girl!! I think both Plum and Poppy thoroughly enjoyed themselves. Happy New Year and here's to a happy and successful 2016. Good start with a win for Islyn Balch at Barton BSPS show, qualifying her for the winter championships. Panther is now backed and will make his ridden debut next year. He is a lovely boy with a fabulous temperament. Another pony off to her new home. Withymead Pippa left for her new Pony Club home which is fairly local so hopefully I will be able to keep up to date with what she is up to. Lovely easy Pippa, I will miss her. She was just too good to stay here as a brood mare. Withymead Peroni an outstanding colt foal by Heniarth Dan Dare out of Mynyddtarren Georgia left for his new home joining Waxwing Vangelis with Marnie Riding in Scotland. 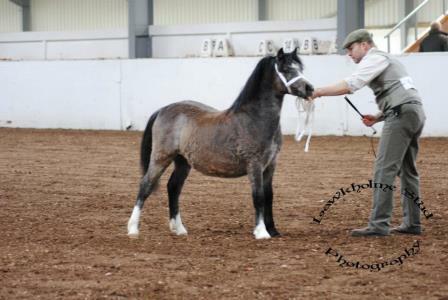 Peroni was 3rd in his class at his first foal show in December and I look forward to seeing him out at the shows in 2016. Waxwing Panama has gone to a fabulous new home and I hope he continues his winning ways with Amelia, Francesca and Pauline. Charlie has had an outstanding season with many wins and placings. 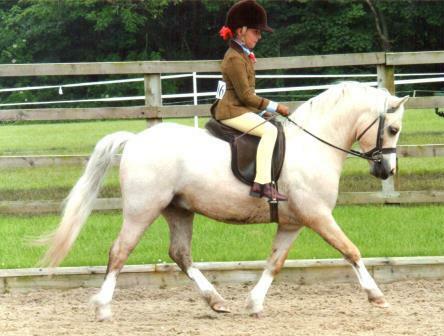 He was in the top 10 of most consistent ponies in the HOYS First Ridden Qualifiers with 2 2nd places at Scottish Horse and Monmouthshire, a 3rd at Midland Counties, 4th at NPS Area 4 and 5th at Derbyshire Festival in massive classes. Islyn Balch took a bit of a back seat to Charlie this year but still enjoyed her Summer trip to the Royal International this time as a First Ridden pony. Plum also had a very successful outing inhand winning the barren mare class and Reserve Champion Section A at the Great Yorkshire Show!! A big thank you to Megan Gardiner stepping in at the last minute to show Plum superbly. I think both of them enjoyed themselves!!! The lovely yearling filly Withymead Cristal had a brief but successful showing career with Liesl Burt with a superb 2nd at South of England (a mixed class of yearling colts and fillies with a good entry forward) and a 3rd at NPS Area 11. Cristal (Heniarth Dan Dare out of Islyn Cantores) then made the long journey to join Josef Richters KVR Stud in Czechoslovakia my first exported pony! Great to be at a show 10 minutes from home! Withymead Pippa plaited up for the first time won both her Open 122cm SHP class and the mixed height novice SHP! -such a good girl. 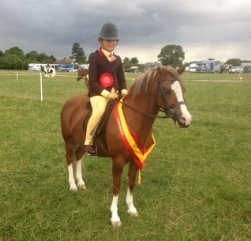 A rather wet and long day resulted in a win for Islyn Balch in the Junior Ridden on the Saturday. 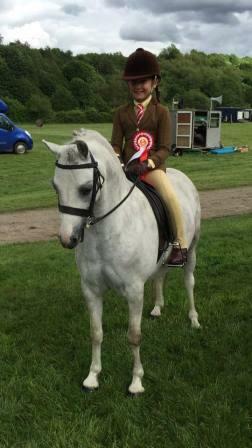 Better day on the Sunday and Waxwing Panama went really well and was 5th in a very strong HOYS First Ridden Class. A fantastic result for Waxwing Panama, 3rd and only 1 mark behind the first 2 ponies in the HOYS First Ridden Qualifier. So close!! What a busy show! and what awful conditions- the ground was horrendous, very heavy going which unsettled Waxwing Panama resulting in a 2nd for him in the Open First Ridden. The ground didn't bother Islyn Balch and she did a fantastic gallop to end up 4th in the RI Junior Ridden. A lovely day and a 10 minute drive resulted in 3 wins and 2 2nds for 5 ponies. 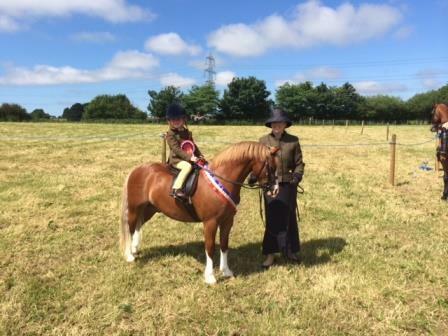 Islyn Balch won the large Junior Ridden Class with Poppy picking up her qualifier for PUK Summer Champs and Equifest. Waxwing Panama won the First Ridden Class qualifying for the Brineton FR Final and the Golden Ticket final at PUK Summer Champs. 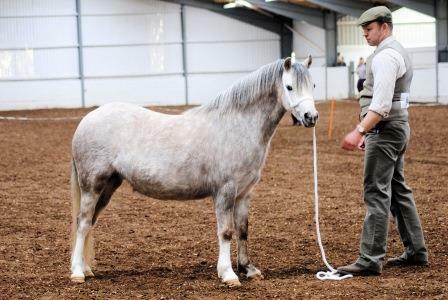 Mount Pleasant Real Magic had 2 2nds in Open Showing under 148cm and Young Handler. 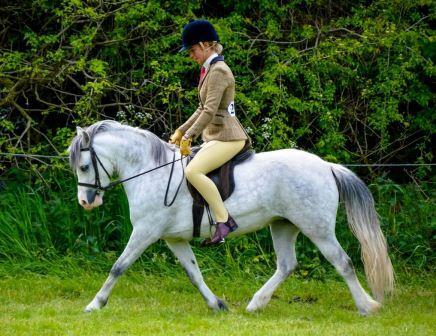 Finally, Tullibardine Wind in the Willows who was backed in February went to her first show and was such a good girl being pulled 3rd in a big Novice M&M Class. Willow took the busy showground all in her stride and wasn't the slightest bit phazed by anything she encountered. She really is the most laidback, kind mare and is so safe. He's certainly consistent and this time we won!! Waxwing Panama 1st in the Pretty Polly Lead Rein RI Qualifier qualfying for the Royal International 2015 with Master Warren Fentiman onboard. Charlie also ended up 6th in the First Ridden RI Qualifier which was just about the last class of the day meaning that we were going to be late home anyway and it got worse as we broke down on the way home and had to be relayed home! Bedtime 1.30am- not good! The highs and lows of showing! Pcked M&M classes but Waxwing Panamaagain went well to end up 6th In a massive RI Lead Rein Class. 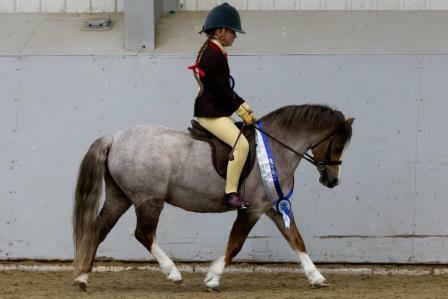 Congratulations to Sharn Linney who won the class with Mardenway Amazing Grace. 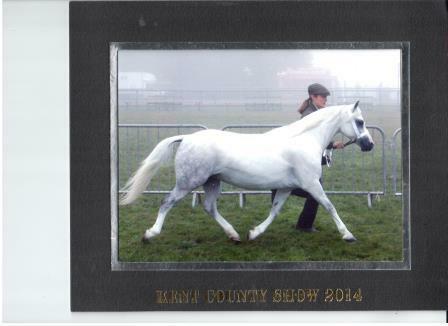 Mount Pleasant Real Magic went superbly to finish 3rd in his RI Show Pony Class, he looked amazing too! Another RI Qualifier and another good result Waxwing Panama 3rd in the First Ridden on a very wet and windy day! Had a funfilled weekend at the Champs with 'The Girls' & Team Fentiman. Waxwing Panama somewhat exuberant initially out of the ring but fab in the ring to come 4th in a large RI Qualifying Lead Rein class and 6th in the RI First Ridden. 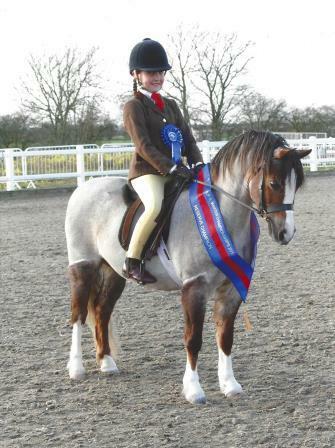 1st in the Pretty Polly Heritage First Ridden in a big class to qualify for the Royal International Horse Show 2015. So pleased for Plum and Poppy. 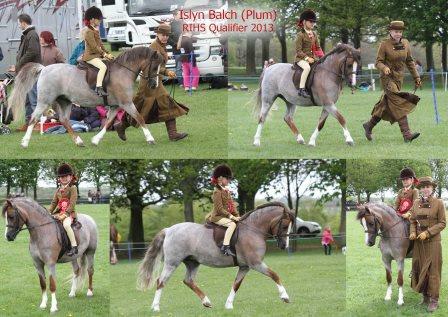 1st show of the 2015 season for us and 1st ridden show for 18 months for Islyn Balch(Plum). I couldn't have asked for a better start!! Plum won a large Open/Restricted First Ridden Class with Poppy qualifying for both of her FR Classes at BSPS Winter Championships and then went Reserve Champion Mini. 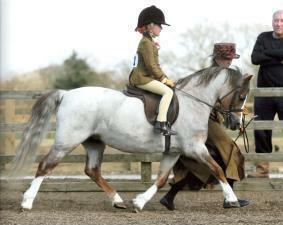 Waxwing Panama also went well to be placed 2nd in the Novice M&M First Ridden and 3rd in the Open A and B Ridden Class. 3 colt foals went off to their new homes. Withymead Talisker made the journey South to join Kay at Lexicon Stud as a potential Ridden stallion. Withymead Yagermeister went locally as a companion and Waxwing Van Gellis returned to Scotland for an inhand career with the Ridings family hopefully returning to Withymead in the future to stand at stud. Waxwing Panama behaved impeccably winning both the Novice M&M Lead Rein with Poppy and Novice M&M First Ridden with Eva picking up his BSPS Winter Championship Qualifiers. 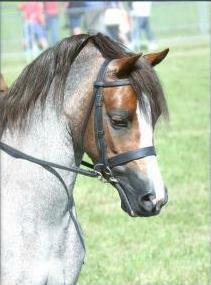 Standing 2nd in line to him in the Lead Rein class was his halfsister Waxwing Angel Eyes. Delighted to welcome their Mum, Roseisle Pangelica as a broodmare. I really can't thank Tom and David at Waxwing enough for Angel who is in foal to Dan for 2015. Waxwing Keavil competing in the M&M WHP with Megan Worton. Sadly he had a pole but both Jazz and Meg obviously both enjoyed their 1st trip to HOYS together. In the M&M Lead Rein 2nd place went to Heniarth Penelope Pitstop who is half-sister to Heniarth Dan Dare Withymead Studs current stallion. 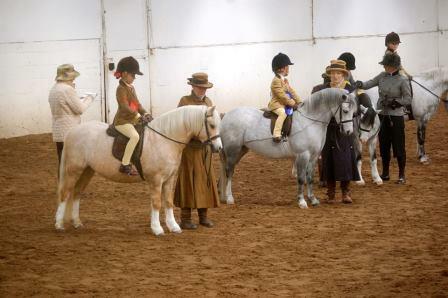 Also pleased to see many of the placed Lead Rein and First Ridden ponies with Roseisle Pandy Tudyr in their breeding. Not organised at all this year so just showing a few of this years highlights! Waxwing Panama (Charlie) was thrown in at the deep end and took to it like a duck to water ending up 3rd in the HOYS First Ridden Qualifier. What a star! 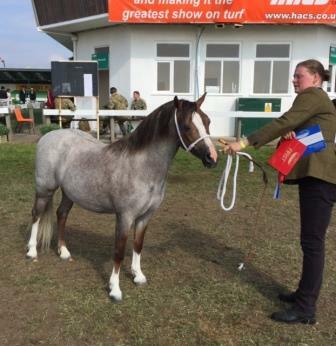 Islyn Balch has had 3 outings as an Inhand Brood mare, and has won 2 of them and been 3rd in the other. She not only won her class here but ended up Reserve Champion and Bronze Medal Winner! Withymead Plum Pudding was a really good boy. A big thank you to Hannah and Eva for showing them. 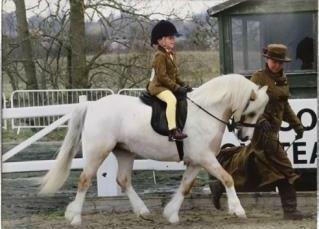 Waxwing Panama started his ridden career with Eva and Poppy Brennand. He behaved brilliantly at this very busy show and was placed 3rd in a big Junior Ridden Class with Eva and then topped it to come 2nd in an even bigger First Ridden Class with Poppy. Charlie has a big future ahead as he is 4 years old and just recently backed. Watch this space! 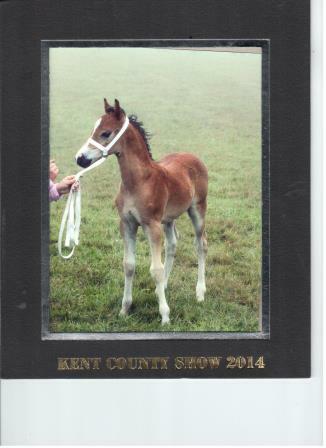 Highlands Juno and her foal Withymead Jagermeister were picked up by Liesl Bury and whisked down to Kent County Show. 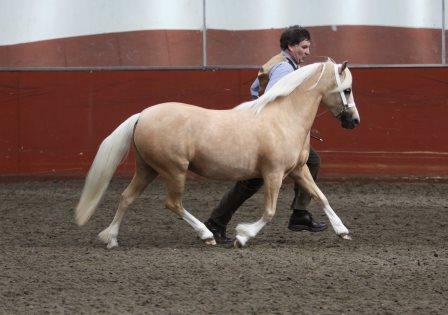 Juno won the brood mare class and then went Reserve Champion picking up her Bronze Medal as the Champion had previously won a Bronze Medal in 2014. She was then asked to go into the Cuddy Qualifier - fab end to the day. but made it a winning one with her jockey Megan Worton. Thank you to Team Starkey for all their hard work. 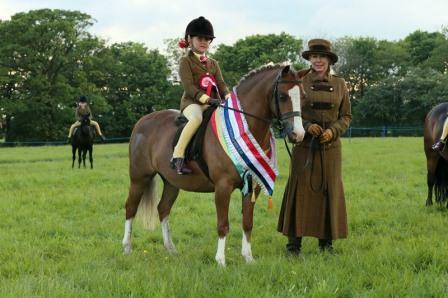 Delighted to hear that Blanche Merlot won his Lead rein Class with Isabel Miller and Becky Balmer at their local Agricultural Show ending the day as Supreme Champion Ridden . A day to remember! 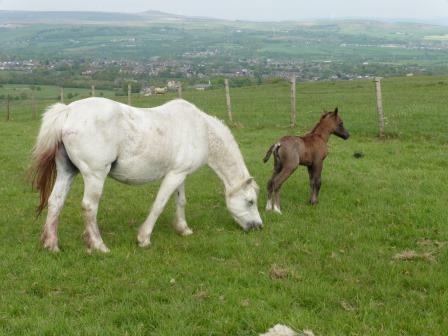 foal , couldn't catch either of them so haven't a clue whether its afilly or a colt. All must be well though 'cos both could certainly move! It was a very very wet day with a lot of ponies misbehaving and not coping with the conditions. Forlan Honey Cookie behaved impeccably and had an amazing day with Poppy and Caz. 1st RIHS LR SHP - our RIHS qualifying ticket. Even got a mention in Horse and Hound! Forlan Honey Cookie 2nd LR SHP in a big class. 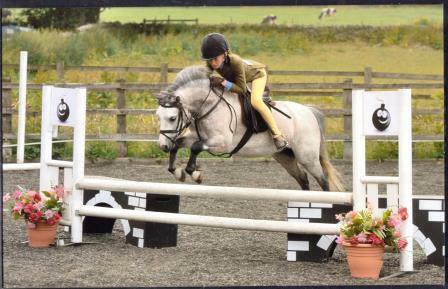 The wiiner qualified for RIHS the following week so in very good company! Forlan Honey Cookie went really well and was 4th in the RIHS Leadrein SHP and 5th in the 12hh SHP. 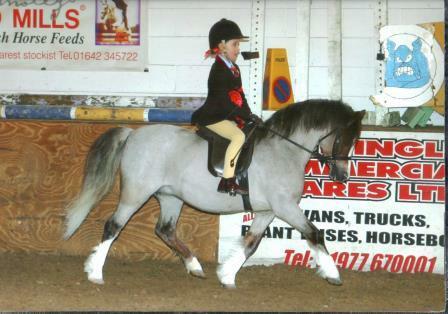 Poppy Brennand was on board in both classes and a big thank you to Caz who led her. A couple of photos of the MacKenzie design multilambfeeder. Fabulous day for Becky Balmer and Isabel Miller with the lovely Blanche Merlot. and after a perfect show in the Evening Performance Supreme Champions. Super stars Mo and Isabel. Tullibardine Wind in the Willows first foal was born. A stunning black(I think!) colt and she's such a good Mum. Islyn Cantores has foaled. A very classy, strong filly foal, bay at the moment but she will go grey. At long last Plum (Islyn Balch) has foaled. She was 8 weeks over due and has produced a tiny bay colt who looks exactly like Dan but with Plum's head. Both mother and baby are fine in their nice warm stable. Starting to get organised for this showing season with lots of Novices to show this year. Plus exciting news of new ponies. Forlan Honey Cookie will continue her ridden career and has also now started jumping so may do some WHP classes with her. 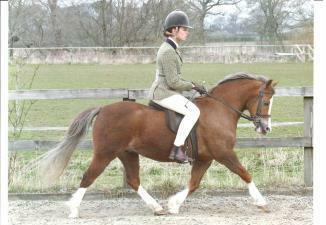 Waxwing Panama is now backed and will start his ridden career very soon. 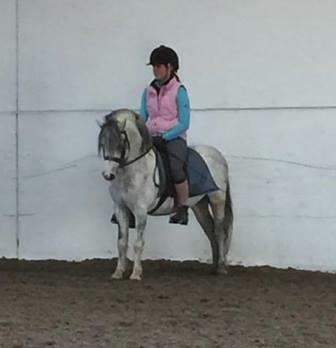 Watch this space as he is a potential superstar Lead Rein and First Ridden with Miss Poppy Brennand in the saddle. 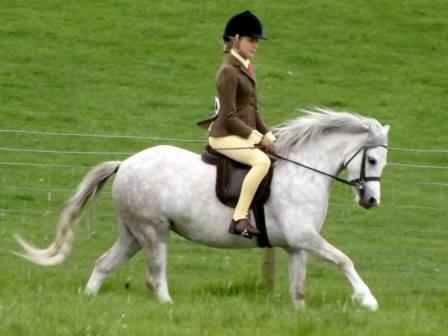 Withymead Pippa is now being backed and will be out at shows later in the season. 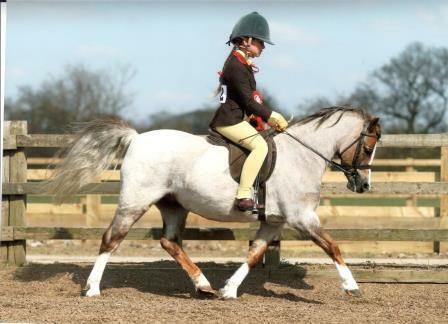 She has grown again over the winter and will be an up to height Section A who will hopefully contest First Ridden, M&M Ridden and Junior Ridden classes. 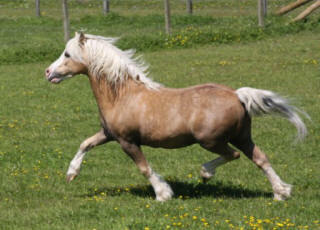 New ponies at Withymead! Islyn Gwenith by the outstanding stockgetter Blanche Gwyllym has arrived from the Islyn Stud as a future ridden pony and brood mare. Her show-winning dam Islyn Hyder is by Waxwing Hurricane. 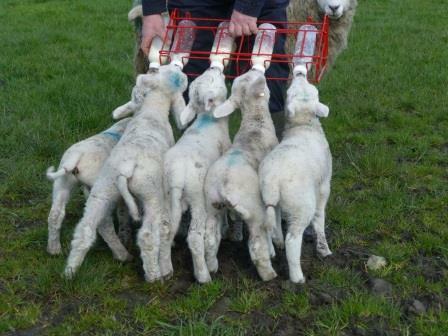 Full details and photos can be found on the Youngstock Page. Also from Islyn I have been incredibly fortunate to be given the chance to loan the stunning Islyn Mecca out of the lovely old mare Bryndansi Melog and by the now sadly deceased Islyn Hafoc. 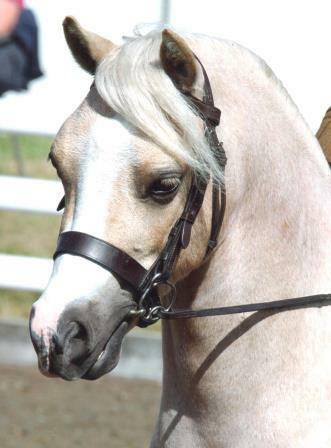 This is an unrepeatable mating and Mecca will be produced as a ridden pony before starting her breeding career. Full details on the Mares Page. Finally I am really excited that another young stallion with fabulous breeding and temperament will stand at Withymead Stud. 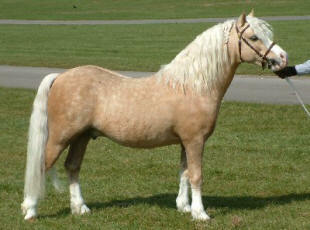 Full details and photos of can be found on the Stallion Page. 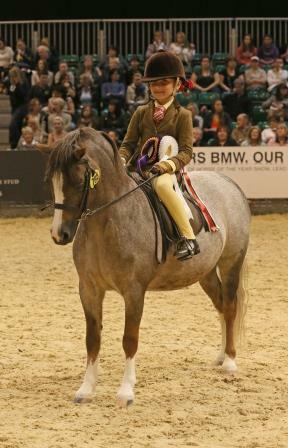 Islyn Balch and Poppy Brennand didn't lose their cool despite it being the first time at HOYS for both of them! 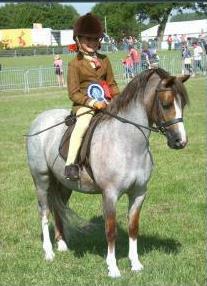 Poppy was the youngest jockey in the M&M First Ridden and was kept in the ring with the prizewinners ending up 10th overall. 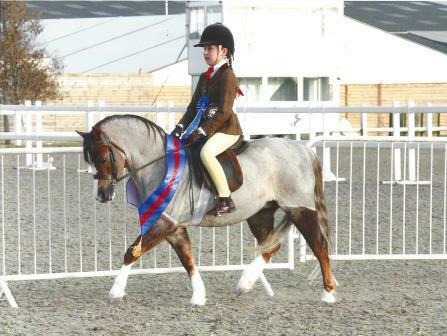 A fabulous achievement for a young jockey who started at the beginning of the season with Plum as her M&M Lead Rein Pony! I am so proud of both of them as they really looked after each other. Exciting news!! Just had my new mare the stunning Highland Juno by Roseisle Pandy Tudyr and she is confirmed in foal to Heniarth Dan Dare. That's 5 foals now due at Withymead Stud in 2014. I think I am going to be busy! I can't keep them all so some of next years foals will be available to good homes and should make the most fantastic childrens ridden ponies as all of them will be descendants of Roseisle Pandy Tudyr, who has again won the award at HOYS for the Welsh Section A stallion who has sired the most successful number of ridden progeny this season - for the second year running. 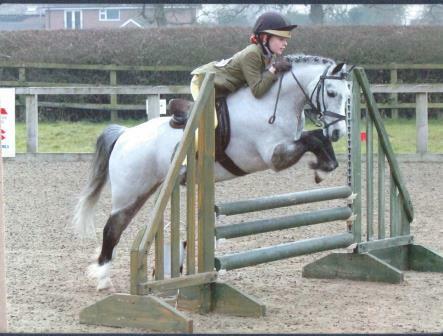 Don't think it is going to take long to back Pippa judging by this picture taken when she was at Stephens! Islyn Balch (Plum) has gone to "bootcamp" at Andrew Leavers in an effort to tone her rapidly expanding foal tummy as time marches on and her trip to HOYS becomes imminent! She is in foal to Heniarth Dan Dare and I am so looking forward to this baby. 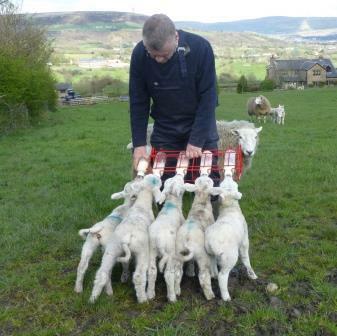 Withymead Pernod has gone to his new home and I believe he has already won and been Champion at a local show. 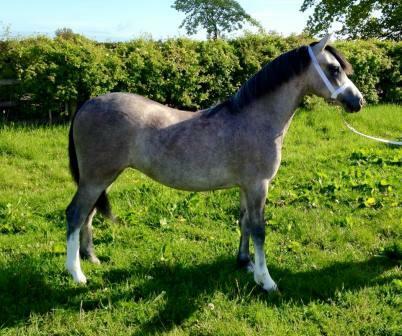 Good luck to Danielle with this stunning young colt. His mother Mynyddtarren Georgia is in foal to Heniarth Dan Dare for 2014. 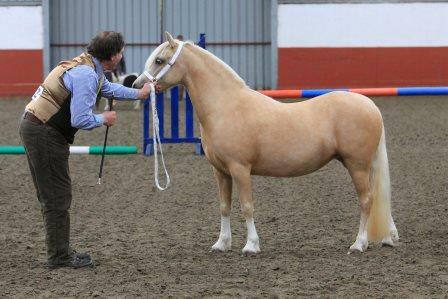 The other 2 mares in confirmed in foal to Dan for 2014 are Islyn Cantores and Tullibardine Wind in the Willows. 4 foals next year should certainly keep me busy. Eva Brennand had a super day. came home with 2 1sts each! 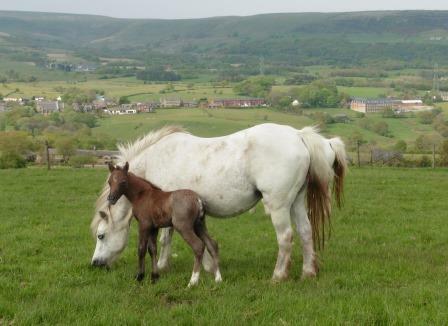 More news of Withymead ponies. 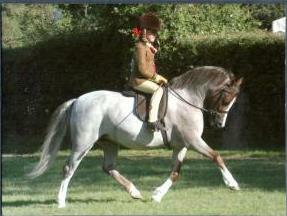 Withymead Amontillado who was sold as a foal is now a verey successful First Ridden and Working Hunter Pony. Honey won her class at Scottish & Northern WPCA and was Youngstock Champion - a super end to her successful 3 year old show season..
A really busy but enjoyable week with our team of girls! 3 ponies and 15 classes- madness!! but we did have our own Camp Chef, the wonderful Debbie who kept us all fed and watered(and wined!) catering for 12 plus of us at every meal. Islyn Balch had some good results in massive classes despite her "baby bump" . 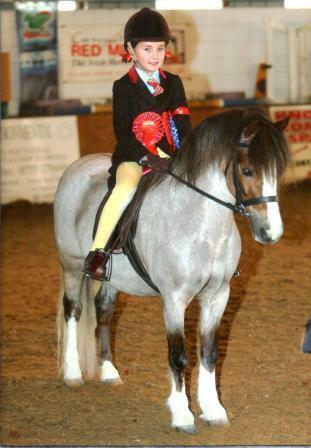 2nd in the Heritage First Ridden, 8th Heritage Young Riders (up to age 14yo) , 6th Heritage Freestyle First Ridden, 7th Black Country Saddles First Ridden and 7th Red Premier Division First Ridden all with her tiny rider 7 year old Poppy Brennand who celebrated her birthday on the Friday of the Show. A fabulous week at the RI with really hot weather during the day and thunder storms at night! 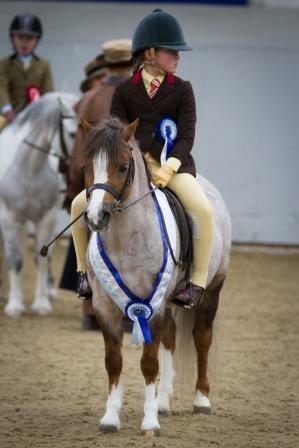 Islyn Balch and Poppy were 8th in the Pretty Polly First Ridden, they both loved every minute of their time in the ring. A day to remember for the Brennand Team!!! 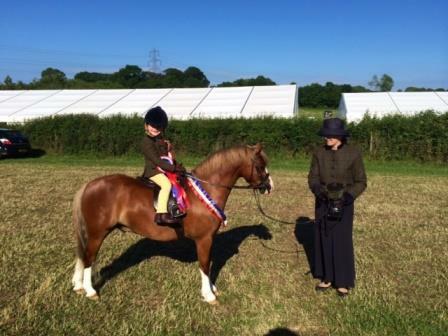 7 year olds Poppy and Plum (Islyn Balch) won a massive Open First Ridden Class and qualified for HOYS. 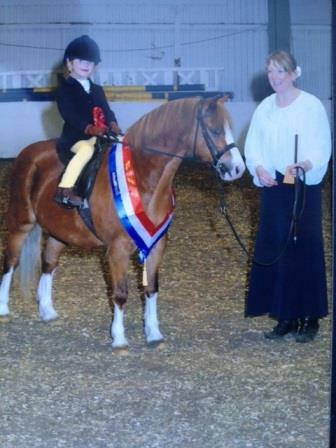 What an incredible achievement for Poppy having only ridden in a handful of shows off the leadrein. 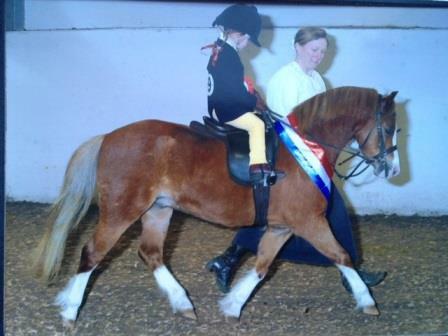 First Ridden HOYS 2013 with a tiny jockey. 1st Junior Ridden with Georgia McCloud riding Cookie for the first time. Islyn Balch did not get pulled into the placings after the "go round" in a 40 strong HOYS Open First Ridden but ended up 9th overall as Poppy pulled out all the stops with an amazing show. Just chilling before her class! In hand following an overnight stay Withymead Pernod 1st Yearling Colt. A very dull day with intermittent rain but the sunshine came out for us in more ways than one!! Islyn Balch and Poppy won the Pretty Polly RIHS Lead Rein and then went on to win the Pretty Polly RIHS First Ridden too! What a day!! Fizzy wine all the way home. Poor Simon! Really busy show with lots of RI tickets on offer. 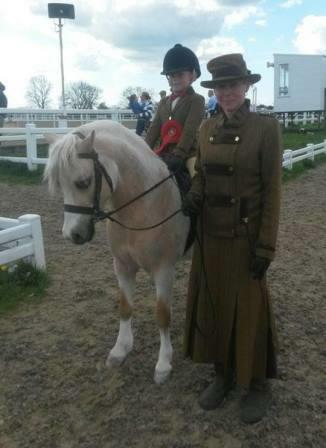 A lovely show from Islyn Balch, Poppy and Caz was rewarded with a 6th place in the RIHS Heritage Lead Rein. 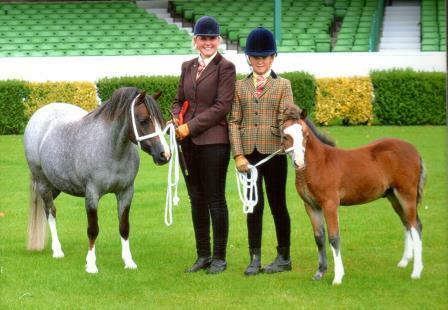 Another good show in the Pretty Polly RIHS Heritage Lead Rein resulted in a 2nd place and big sister Eva was then placed 3rd in the PPolly RIHS First Ridden, again with the super talented Islyn Balch. 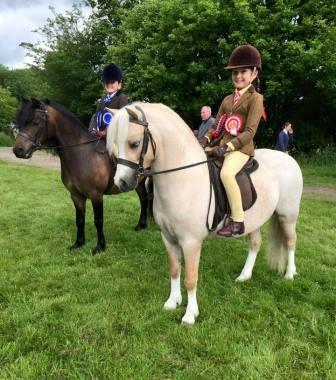 7 year old Poppy Brennand had a fabulous start to her Open First Ridden career with Islyn Balch, a fabulous 7th Place in a HOYS Qualifier against much older jockeys and beating her older sister. 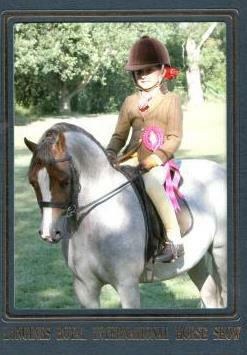 Poppy rode superbly and "Plum" really looked after her. What a combination - lots to look forward to! Really windy driving on the M62 and very windy at the showground, luckily we were indoors! Islyn Balch was footperfest again and just missed out on her Royal International ticket with a 2nd in the Pretty Polly RIHS Lead Rein Qualifier. Both ponies went really well. Thank you to Stephen, Beth and Cath for all their help and encouragement. A really busy show with big numbers in the M&M classes but Islyn Balch went really well.